The class professionals gather once a month October through May (following an overnight retreat in September) to learn about social issues, challenges, and opportunities facing the Green Bay area, get exposure to relevant leadership education and skills, and become community stewards. Each monthly gathering has a specific focus (from local government to education to the economy), and learners are immersed in a full-day interactive lesson that includes guest speakers, team-building exercises, and networking. The program culminates by participants organizing into teams, identifying social or public opportunities, and working on community projects that are designed to raise awareness of an issue, improve team skills, and effect change. All UW-Green Bay employees are eligible to express interest in being considered. Supervisors are also encouraged to nominate employees for participation in this program. If nominating an employee, please notify this person to determine if they are willing to participate before submitting. After the deadline, one employee will be selected by the Position Review Committee, and will asked to complete the application materials representing UW-Green Bay. In order to express interest in participation, or to nominate an employee, please complete the Interest Form. This form should be filled out and signed by the employee, their supervisor, and the Dean/Division Head (if applicable). Completed forms must be received in the Human Resources office by Monday, March 11th for full consideration. You are also welcome to visit https://www.greatergbc.org/workforce/leadership-green-bay/ for more information about this program. In order to express interest in participation, or to nominate an employee, please complete the Interest Form. This form should be filled out and signed by the employee, their supervisor, and the Dean/Division Head (if applicable). Completed forms must be received in the Human Resources office by Friday, March 16th for full consideration. You are also welcome to visit http://www.greatergbc.org/workforce-development/leadership-green-bay/ for more information about this program. Clery CSA Training (only required if designated as a Campus Security Authority – training on the Office of Public Safety web site). Log into Everfi/LawRoom utilizing the e-mail that was sent to you during the week of January 23rd or by going directly to the website at https://el.lawroom.com/login.asp. 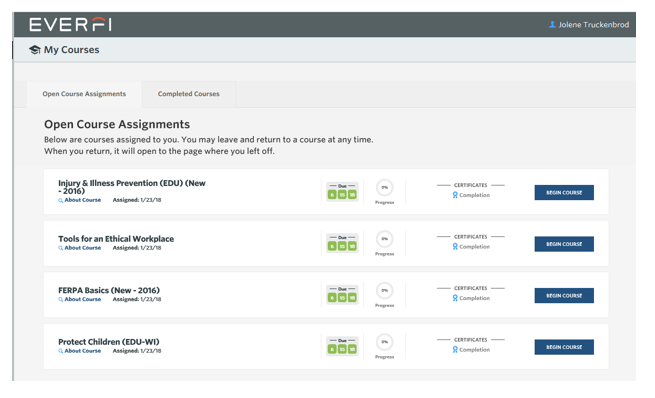 Select “My Courses” from the menu on the left side of the page. This view will show all outstanding courses and their due dates. If a course does not appear in this list, please check your completed courses, as it is likely the course has already been completed. Faculty and staff must complete all required compliance trainings by Friday, June 15, 2018 in order to be eligible for a proposed FY 2018-2019 pay plan. Please see the Compensation and Pay Plan Policy for additional eligibility requirements.